CHAUVET DJ will release 16 new lighting fixtures and accessories at the 2015 NAMM Show this month in Anaheim, California. These game-changing new products range from moving head fixtures, hex technology fixtures and battery-powered wireless lights, to new gear bags and a cutting edge new lighting controller. “As always, CHAUVET DJ’s new products are designed to give entertainers and event producers of all kinds the ability to add dramatic lighting to their events,” said CHAUVET DJ Senior Product Manager Allan Reiss. “We’re excited to provide a whole new set of powerful tools to add to our existing products that will let them do that quickly and easily. DJs and event designers are always looking for convenient wireless lighting solutions, hex technology and dynamic moving head fixtures. These new products will definitely meet those needs”. NAMM visitors can get a hands-on introduction to the new products at the CHAUVET DJ booth #5574. The 6Spot Quad IRC is an all-in-one fixture consisting of six movable heads on a single bar containing high-powered Quad-Color (RGBW) LEDs. The six movable heads make pin spotting multiple locations or achieving total room or stage coverage easy. The 6Spot Quad IRC’s unique slip-over design that fits most tripod stands and the included L-brackets and clamping locations make mounting possibilities limitless. Pre-programmed light shows can be accessed wirelessly using the optional IRC-6 remote. The included carry bag makes set up and tear down easy. The newest addition to CHAUVET DJ’s EZ line of battery-powered, wireless fixtures is the EZWash Hex IRC. Created in the image of its predecessor, the wildly popular EZPin IRC, the EZWash Hex IRC is a compact wash fixture using 6-in-1 (RGBAW+UV) technology, creating literally trillions of colors. Battery powered means no cables to deal with, making set up and tear down fast and easy. Control is simple and easy using the optional IRC-6 remote control. 9 preset colors custom mixed for the EZWash HEX utilize the HEX LED to its fullest. The IRC-6 remote also allows custom color mixing and access to pre-programmed automated and sound activated shows. The EZWash HEX’s white housing is perfect for elegant events such as weddings and art shows. Like the EZPin IRC, the EZWash Hex IRC features a magnetic mounting plate and included scissor clip base, offering the fastest set up and tear down of any wash light on the market. The EZWash Hex IRC is also available in the EZWash Hex Pack, a case that includes 6 fixtures, charging unit and IRC-6 remote control. CHAUVET DJ’s venerable Intimidator line of moving head fixtures gets 3 exciting new additions at NAMM. 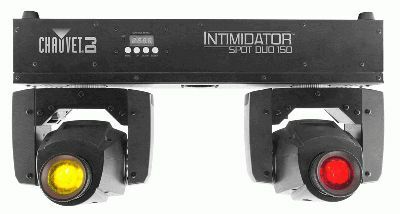 The Intimidator Spot Duo 150 features two powerful Intimidator Spot LED 150 moving heads pre-mounted on a single bar. The unit’s built-in pass-through hole allows it to be safely mounted on tripods, and its bright, compact and lightweight profile makes it perfect for mobile applications. Generate synchronized shows in Master/Slave mode with up to two units, which could be in combination with first generation Intimidator Spot Duos as well. Increase design flexibility and effects with separate color and gobo wheels. The Intimidator Spot Duo 150 allows you to enhance any light show with super smooth dimming and adjustable strobe speed. The fixture’s separate built-in movement macros for sound and automated modes minimize programming time. Power link multiple Intimidator Spot Duo 150 fixtures together to save time running cables. The Intimidator Spot 255 IRC is a feature-packed moving head spot fitted with a 60W LED to enhance any event or installation. Some of the most exciting features of this powerful new fixture are 3 new operating modes never before seen. “Totem Mode” allows users to limit the pan and tilt parameters to keep the light effects forward focused on the dance floor. “Manual Mode” allows the user to create a custom look and have it stored to recall whenever the light is turned on. “Delay Mode” is an advanced Master/Slave mode that allows users to operate up to 4 fixtures in Master/Slave mode, but will randomly create and add synchronized movement variations, making it appear as though complex light shows have been created. The Intimidator Spot 255 IRC’s full color LCD menu screen and full text readout make it easy to navigate. Time saving features include built-in effect macros and move-in-black capabilities, as well as the ability to power link multiple units together to save time running cables. Project the light where you want it with user-selectable pan and tilt ranges, and achieve super smooth LED fading with the built-in electronic dimmer. The Intimidator Spot 255 IRC allows you to split the beam and cover a larger area with the 3-facet prism, and its easy-access gobo door allows you to quickly and easily change gobos. Create continuous shows with individual reset of pan/tilt, color, gobo and prism. Convenience is always at hand with the Intimidator Spot 255 IRC with sound activated programs and wireless non-DMX control with the optional IRC-6 remote. The Intimidator Spot 255 IRC fits best in the CHS-40 VIP gear bag. The Intimidator Wave 360 IRC is a stunning moving light array with 4 independently controlled heads on a single rotating base. Its narrow, razor-sharp beams of RGBW light create astonishing aerial effects, and continuous pan rotation and 4 tilting heads create unique and amazing effects unlike any other light. The Intimidator Wave 360 IRC has an easy to use full color menu interface, making manual operation simple and quick. Convenience features include wireless non-DMX control with the optional IRC-6 remote and the ability to power link multiple units together to save time running cables. The Intimidator Wave 360 IRC’s adjustable pan and tilt ranges put light where you want it, and the Master/Slave mode makes it easy to generate coordinated light shows. Built-in movement macros and color programs create complex looks easily. The Freedom Strip HEX-4 is another great addition to the Freedom family of fixtures, which all include built-in D-Fi transceivers, batteries and IRC remotes. The Freedom Strip HEX-4 has 2 zones of control to create great chase effects. 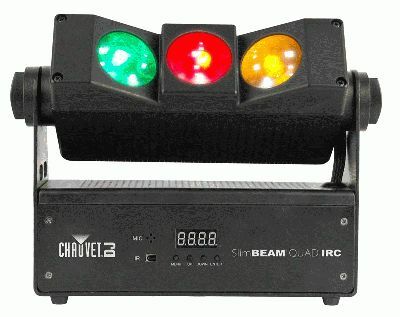 The Freedom Strip HEX-4 also works with CHAUVET DJ’s FlareCON Air wireless transmitter. This 100% wireless linear wash fixture features 6-in-1 LED technology (RGBAW+ UV) to produce trillions of colors. Built-in automated and sound activated programs are also featured, making light show creation easy. An IRC-6 remote is included. Another UV fixture making its debut this month is the Slim Strip UV-9, an ultra-compact (0.5m) and powerful black light. Whether highlighting specific areas or just having a black light party, this economical and powerful fixture is a perfect solution. Truss mountable-design, included L-Brackets and safety cable attachment allow this unit to be mounted at any conceivable angle. The SlimBEAM Quad IRC is a wall accent and effect light all in one. This linear fixture features a unique design that creates dramatic beam effects that go beyond a standard uplight. Of course when the SlimBEAM Quad IRC is used in conjunction with other conventional uplights, breathtaking wall and ceiling effects are possible. The SlimBEAM Quad IRC has three Quad-Color LEDs (RGBA) in a single bar that can be tilted up to 180°, providing added lighting flexibility. No moving parts means silent operation, and multiple units can be linked together to create unique wall effects. The SlimBEAM Quad IRC’s eye-catching effects can be triggered with built-in automated programs, via Master/Slave mode, DMX or optional IRC remote. Fitted with 3W LEDs to punch through nearly any ambient lighting, the Mini Kinta™ IRC fills the room with sharp beams and features more output and broader coverage than derby effects twice its size. Simple wireless, non-DMX control from the optional IRC-6 allows you to create the perfect looks without having to be a programming genius. Floor-to-ceiling and wall-to-wall coverage is effortless with red, green, blue and white effects. Let the built-in programs do the work or use DMX to program your own light show. The new JAM Pack Gold and JAM Pack Silver are bundle packs of fixtures and effects providing convenient ways to add multiple units to your lighting inventory. The JAM Pack Gold is the perfect combination of four party-ready products that are ready to use right out of the box. JAM Pack Gold includes a Derby, Laser, fog machine, and a UV wash/strobe combo light. The JAM Pack Gold also features easy wireless control of color, auto and sound mode from the included IRC-6 remote. The JAM Pack Silver is a convenient package of 3 effect lights - a Moonflower, 3-color wash effect light and combo UV wash/strobe. The JAM Pack Silver also features easy wireless control of color, auto and sound mode from the included IRC-6 remote. This year’s NAMM show will see the release of an innovative new CHAUVET DJ light controller. The FootC is a compact 36-channel DMX foot controller with rugged guitar pedal-style buttons to easily activate built-in auto and sound modes for control of chases and scenes. The FootC can control up to six 6-channel fixtures and store 12 sets of chases containing up to 24 steps each. It works with MIDI technology and has a direct line in so musicians can send an audio feed directly into the controller to trigger scenes to the beat. The FootC also has the ability to save and recall 24 scenes and trigger them in auto mode or sound mode. CHAUVET DJ’s Freedom line of wireless fixtures grows with a brand new way to transport and charge them. The Freedom Charge 9 is the perfect solution for safely transporting and charging your Freedom™ Par fixtures. This durable, rolling road case easily handles all the punishment a mobile entertainer can throw at it. When the gig is over, simply connect the fixtures to the internal charging module and use the external plug to connect directly into standard wall voltage. The next day, fixtures are fully charged and ready to go again. 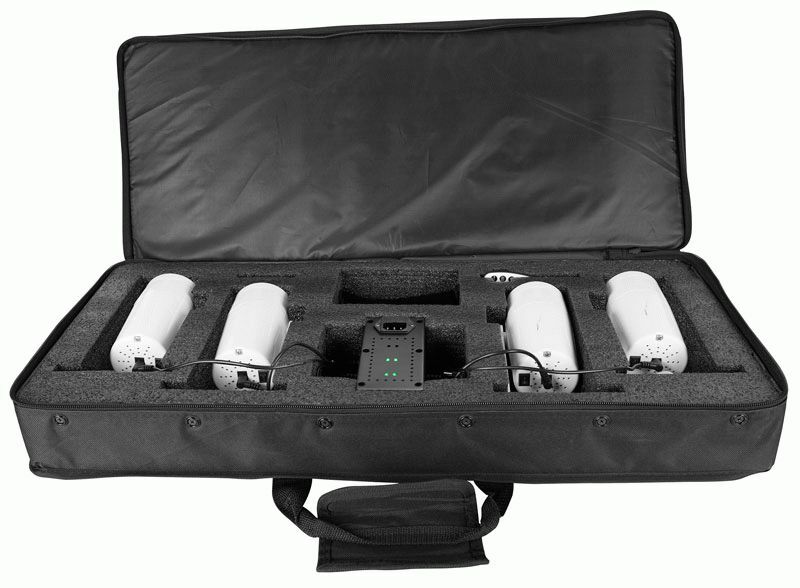 Each case holds up to 9 Freedom Par Tri-6, Quad-4 or Hex-4 fixtures with enough space for all power cables. CHAUVET DJ will debut two new gear bags as well. The CHS-DUO VIP gear bag is a durable, gear bag that is hard on the outside but extremely soft on the inside. Its internal compartment is custom-molded to fit an Intimidator Spot Duo or an Intimidator Spot Duo 150 so it can be easily transported from gig to gig. There is enough space inside to keep the hanging bracket installed on the fixture, which saves time during set up and tear down, and a convenient side pocket fits the user manual for on-site referencing. The CHS-WAVE VIP gear bag also has a hard shell outside but is extremely soft on the inside. Its internal compartment is custom-molded to fit an Intimidator Wave IRC. Like the CHS-DUO, there is enough space inside to keep the hanging bracket installed on the fixture which saves time during set up and tear down, and a convenient side pocket fits the user manual for on-site referencing.